Hidden Oasis. These are the two words that immediately come to mind and so accurately describe The Langham Huntington hotel. Nestled at the base of the picturesque San Gabriel Mountains in an upscale, residential area of Pasadena, lies the the unexpected, iconic property of The Langham Huntington where sights, sounds, scents and touches captivate your soul even long after you leave. Pulling into long driveway and porte cochere you are greeted by friendly faces from the valet dressed in plaid suits and berets. Their welcoming smiles already put you at ease as you stroll though the entrance as soft music plays overhead. Magnificent floral arrangements catch your eye as the sweet fragrance of roses, peonies, and orchids fill the ornate lobby. 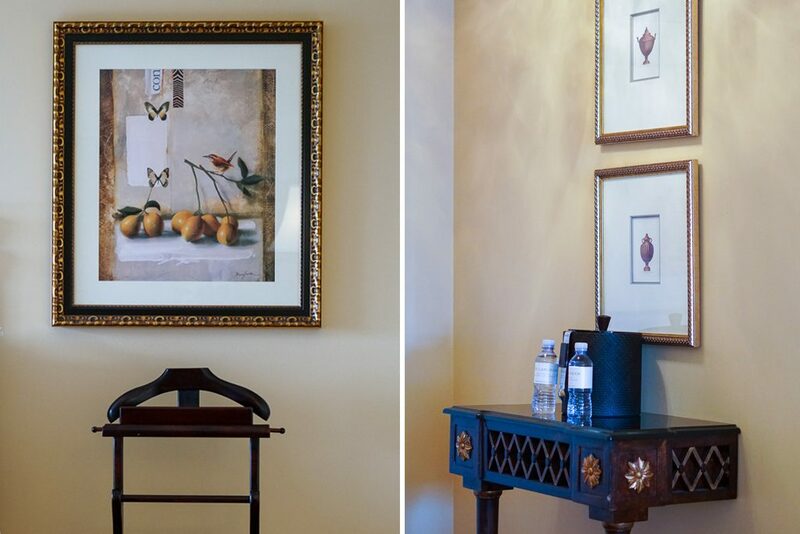 Check-in is incredibly swift (always a plus), with attentive service and a quick description of the lavish grounds. 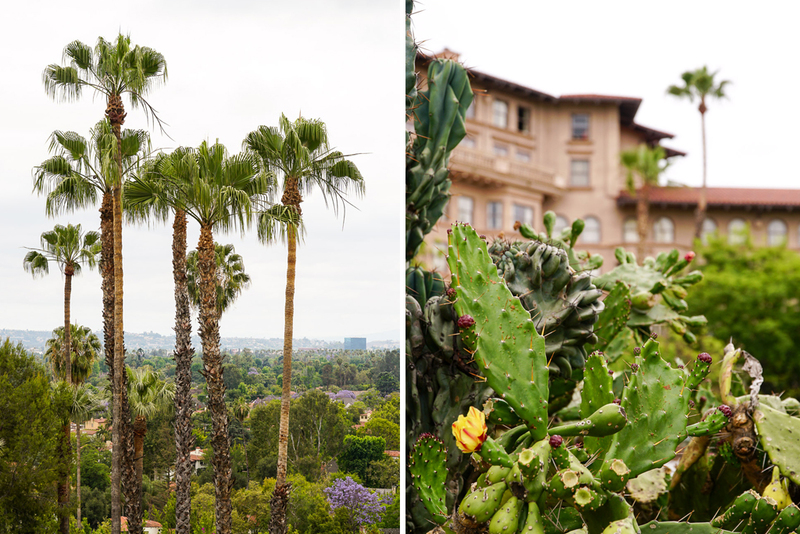 The Langham Huntington encompasses 379 rooms, suites and cottages across 23 acres of lush property. 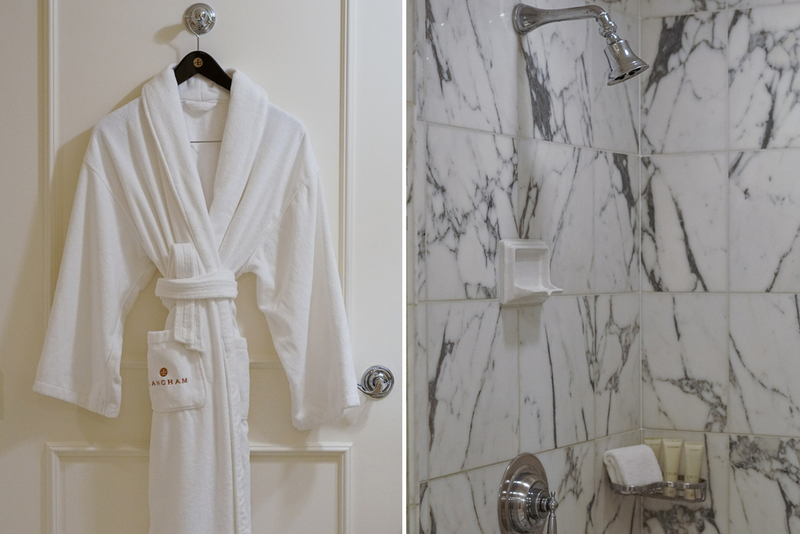 We rushed to our Deluxe Premier room excited to begin our stay. 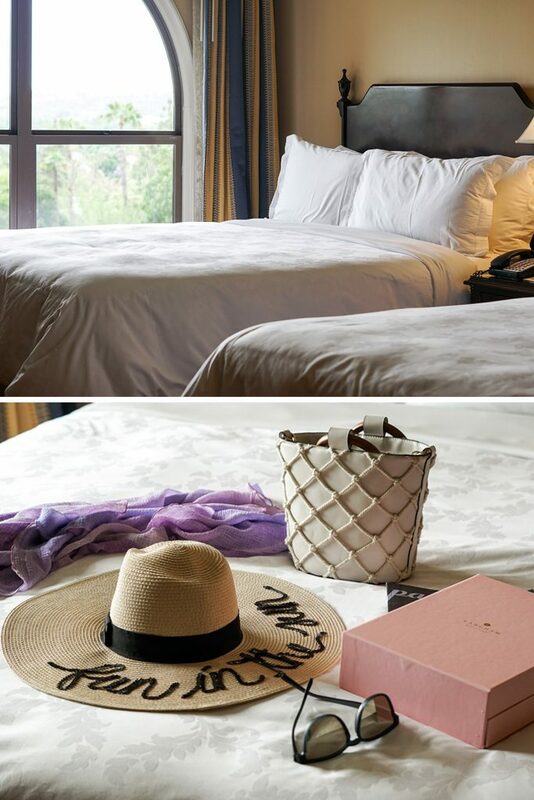 The double bed room is well appointed and reflects classic luxury. The grand window overlooking the expansive Horseshoe Garden and city views allows for natural light to fill the room. 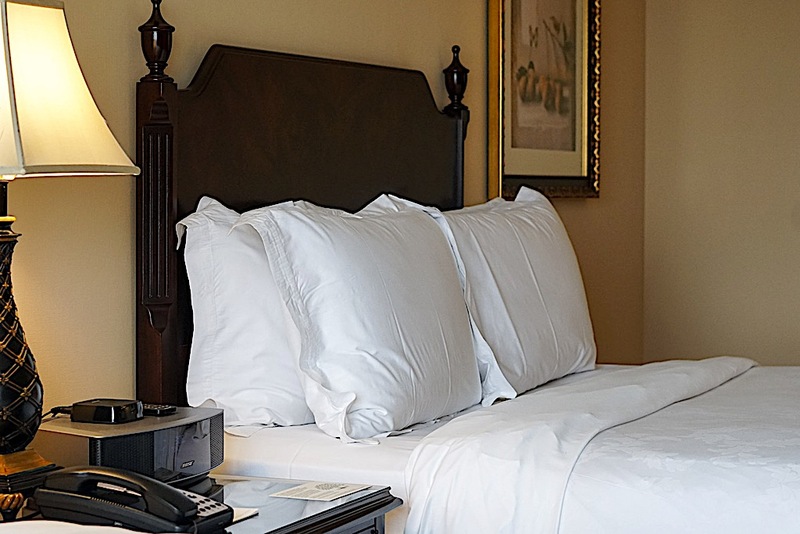 The tasteful decor is elegant and luxurious, yet also extremely comfortable. 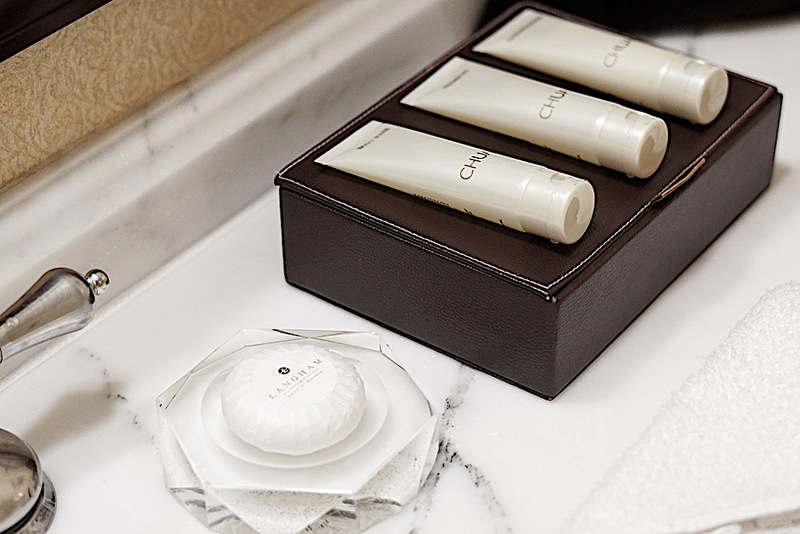 The room is complete with every amenity possible from an en-suite Nespresso machine, complimentary bottled waters, welcome cookies and sparkling juice, plush robes and cozy slippers, to toiletries including dental and shaving kits, mouthwash and even hair combs. 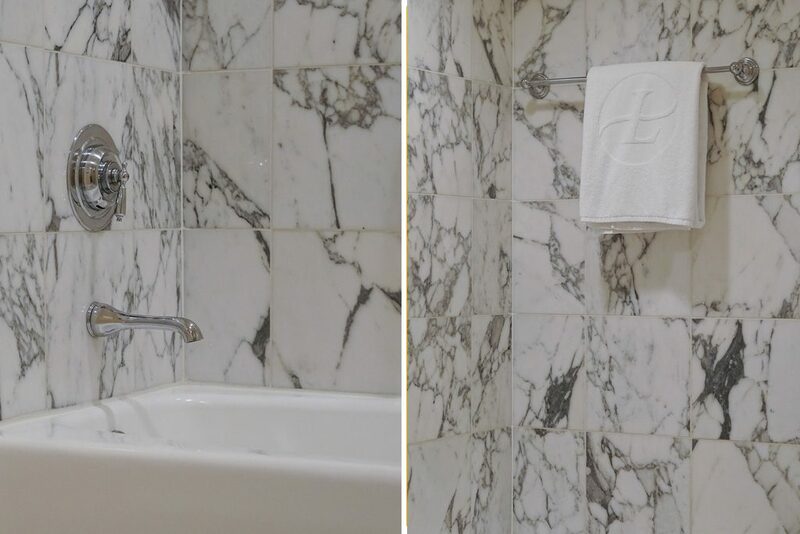 I was surprised by the vastness of the bathroom which is covered in stunning Italian marble with extensive counter space, separate bathtub, and standing shower. 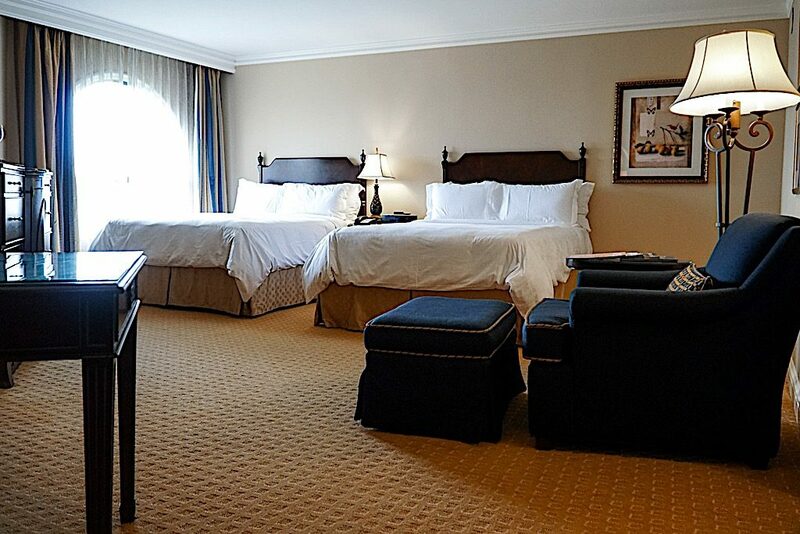 The Deluxe Premier room is more than spacious enough for our family of five and was such a comfortable stay. What surprised me the most is how peaceful and quiet the room was even with our kids with us. 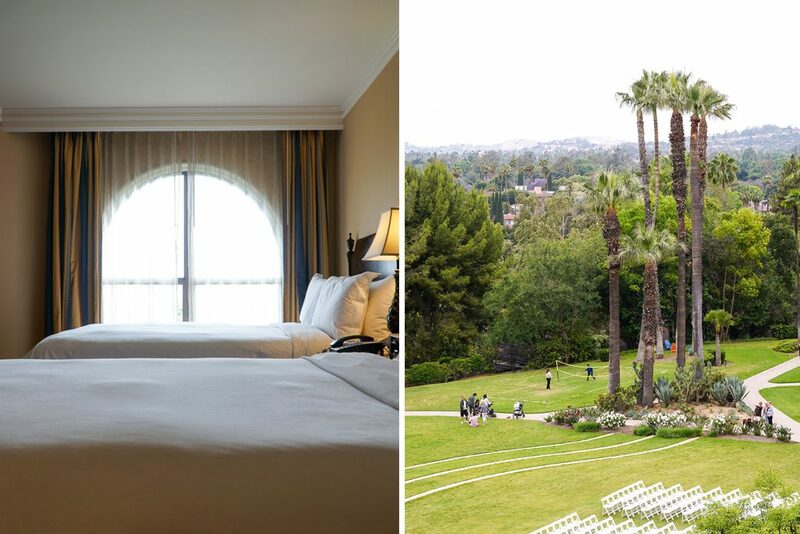 Aside from the serenity of the room, the entire surroundings of The Langham Huntington are so peaceful. 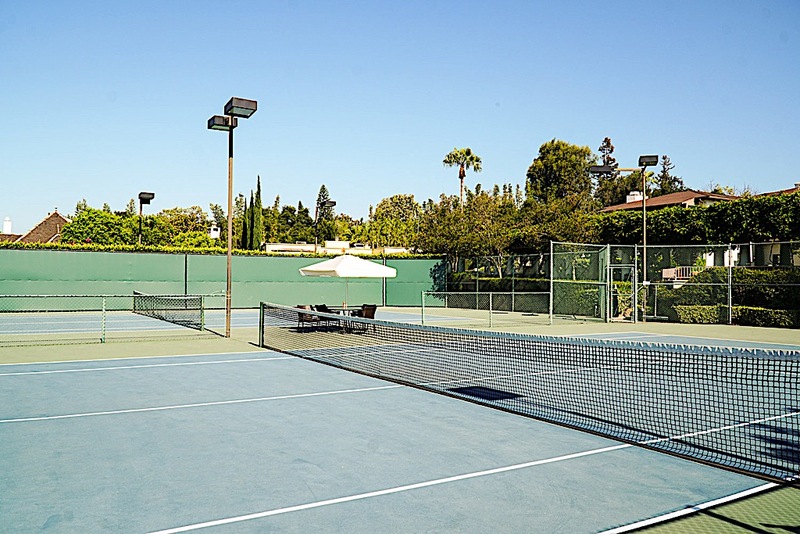 As you wander the immense property, the sounds of birds chirping overhead, the majestic fountains spilling over with water, laughter of children in the pool, tennis balls bouncing in the distance all ignite your senses. 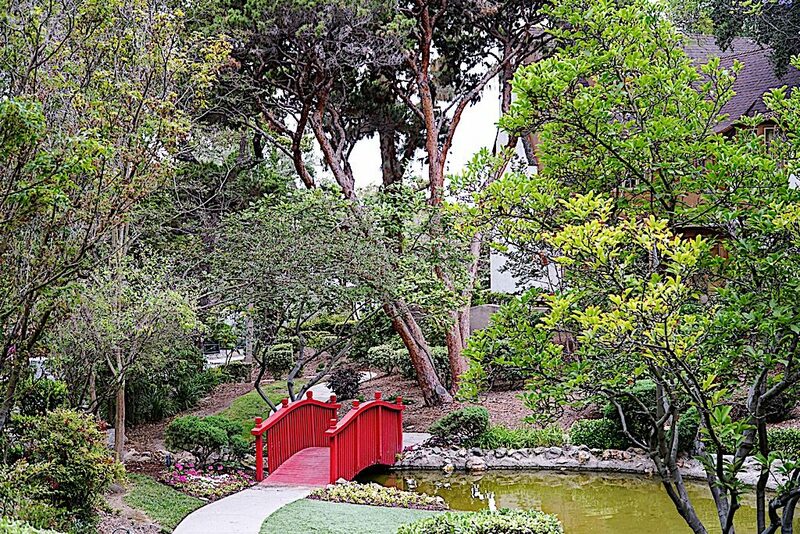 You see families playing badminton across the Horseshoe Garden, adults playing croquette nearby, couples strolling the trail to the Japanese Garden, and curious children examining the different herbs in the herb garden. 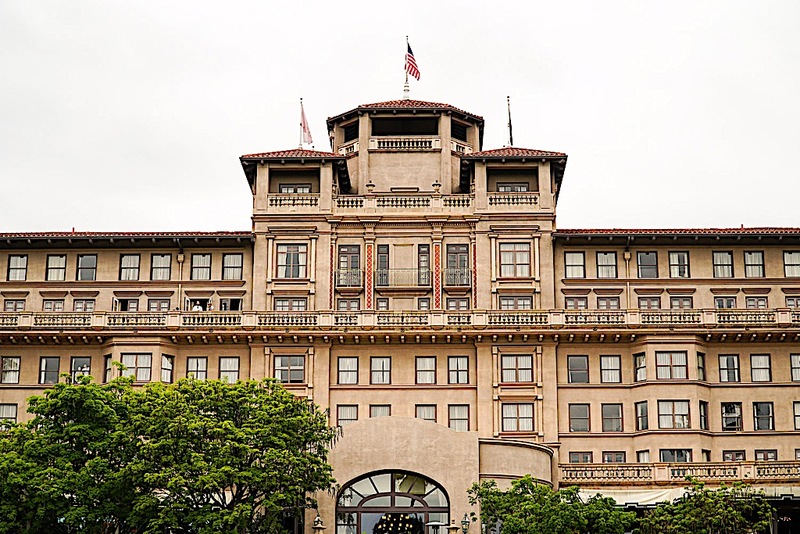 There is so much to see on this 23-acre property that the hotel even offers Historic Hotel Property Tours! Everything is picturesque, everything is charming, everything is endearing. So much so that we hardly left the property! 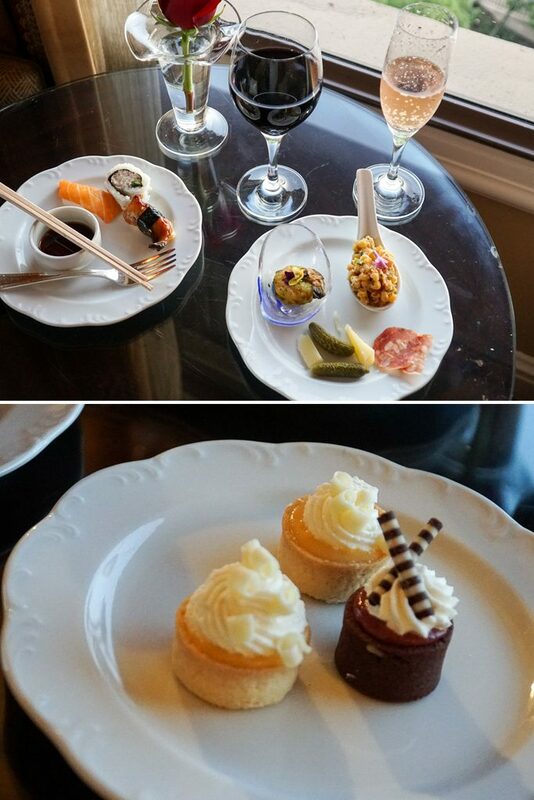 Our meals were pretty much all eaten at The Langham Club Lounge because we honestly didn’t want to nor felt the need to leave the hotel. While the Club Lounge isn’t intended to be a restaurant, it might as well be for the premium selection of food and beverages served throughout the day. For a family, access to The Club Lounge is key because there is something for everyone (even the pickiest eaters) from the extensive continental breakfast in the morning to the light snacks and Afternoon tea (complete with scones and creme fraiche) during the day, to the hors d’oeuvres and cocktails which pretty much could be a meal with the sushi and charcuterie platters they provide, as well as sweet treats and after dinner drinks in the evening. And let’s not forget the large jars of candies and chocolates readily available too! There are so many other services provided with access to The Club Lounge as well. 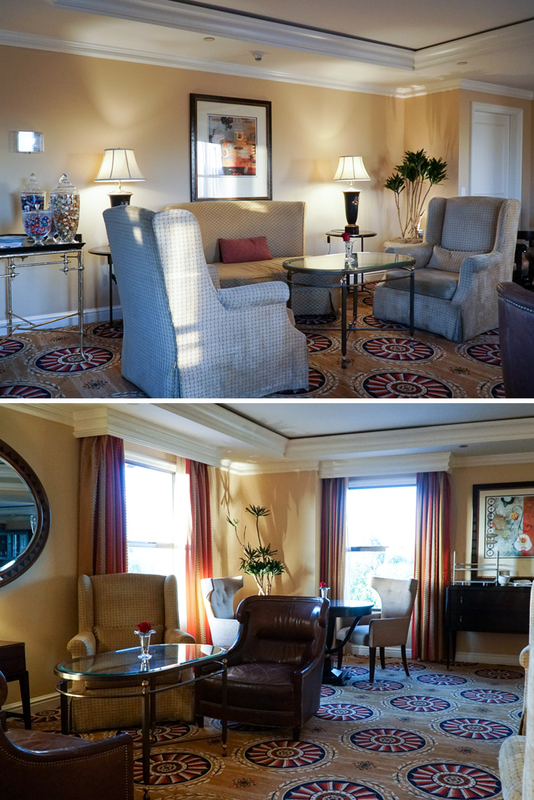 Let’s just say we probably spent as much time relaxing in the sanctuary of The Club Lounge as we did in our suite. In addition to the delicious treats at The Club Lounge, there are plenty of incredible restaurants at The Langham Huntington too. For more casual, alfresco dining experience with views of the pool and Picture Bridge there is The Terrace. If you haven’t already been to Afternoon Tea at The Langham, it is a must-try experience. 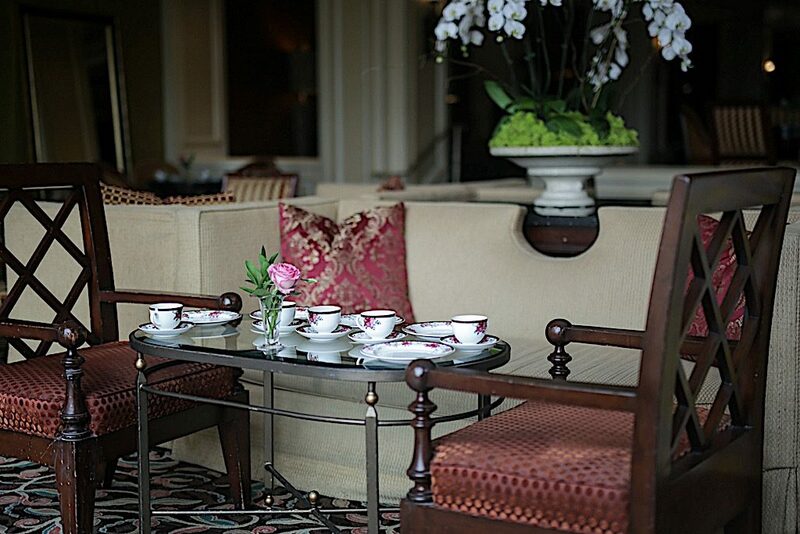 This Afternoon Tea tradition is what The Langham brand is most known for and includes delectable tea offerings and sandwiches all served on tailor-made “Langham Rose” Wedgwood teaware in the Lobby Lounge. 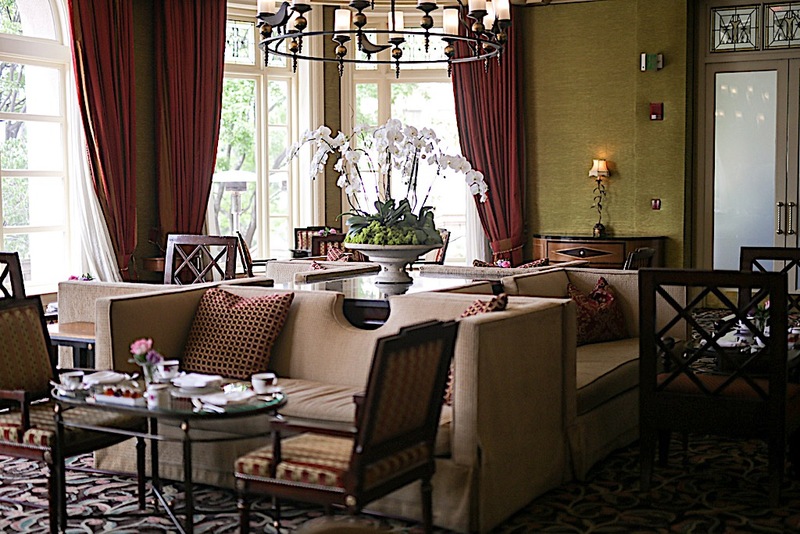 And if you’re in the mood for something stronger than Afternoon Tea, adjacent to the Lobby Lounge is The Tap Room which features handcrafted cocktails, a diverse wine selection, premium beers on tap, and innovative bar food. 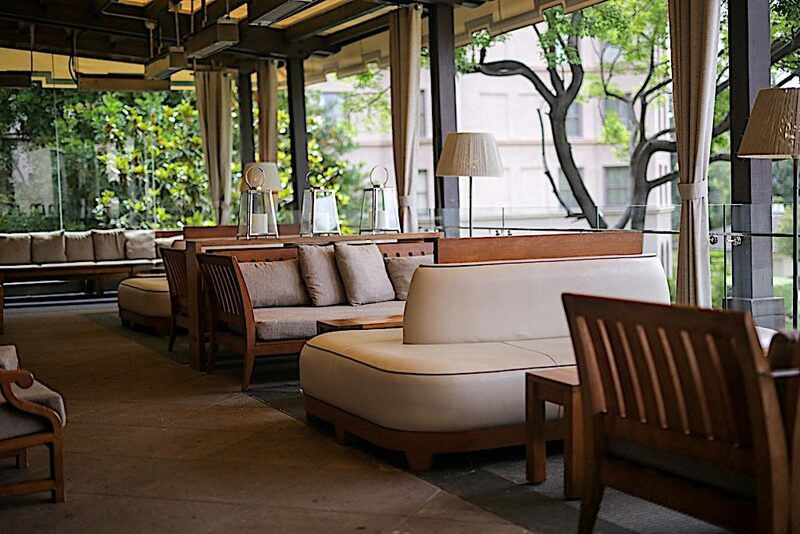 And finally for an unbelievable steak dinner, head straight to The Royce Wood-Fired Steakhouse for the finest cuts of meat including Wagyu and Kobe with stunning views of the immaculate garden with seating near the glass-enclosed veranda. As you can see, there are plenty of dining options for everyone here at The Langham Huntington that you really have no reason to leave. And for those moments we weren’t strolling the immaculate grounds, or relaxing in the comfort of our room and The Club Lounge, we lounged around the pool getting some vitamin D. What I like about this pool is that there are plenty of deck chairs surrounding the pool as well as cabanas, outdoor showers, and a bar in the back for some refreshments. They even have one lane in the pool for more serious swimmers. During summers The Langham Huntington offers fireside s’mores, cocktail specials, and live music on the weekends. My favorite part of the pool is the cutest ice cream cart which hands out frozen treats in the summer. You can bet we had the best time with this darling cart! We thoroughly enjoyed our stay here at The Langham Huntington amongst the stately grounds with old world charm and lavish details. Every sound from the gentle music to the rustlings of nature, it truly was a hidden oasis and one that has left a memorable mark in our hearts. 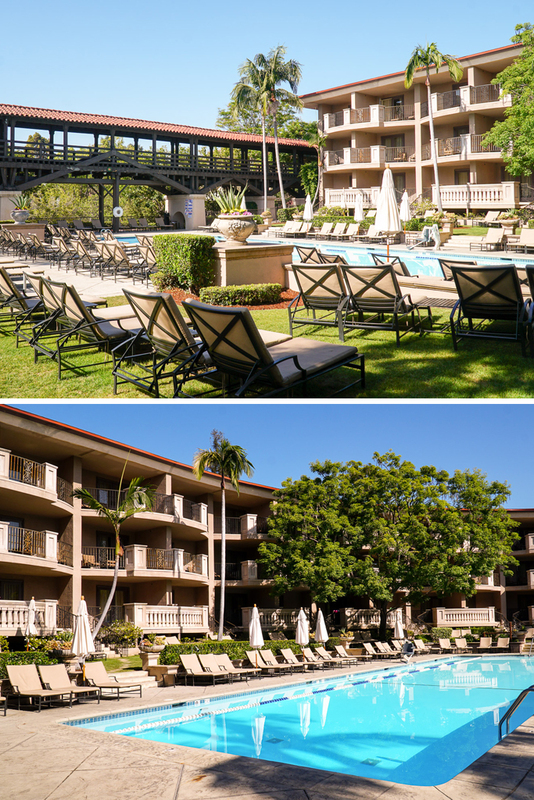 To view the current offers and escape to this peaceful haven, click here. 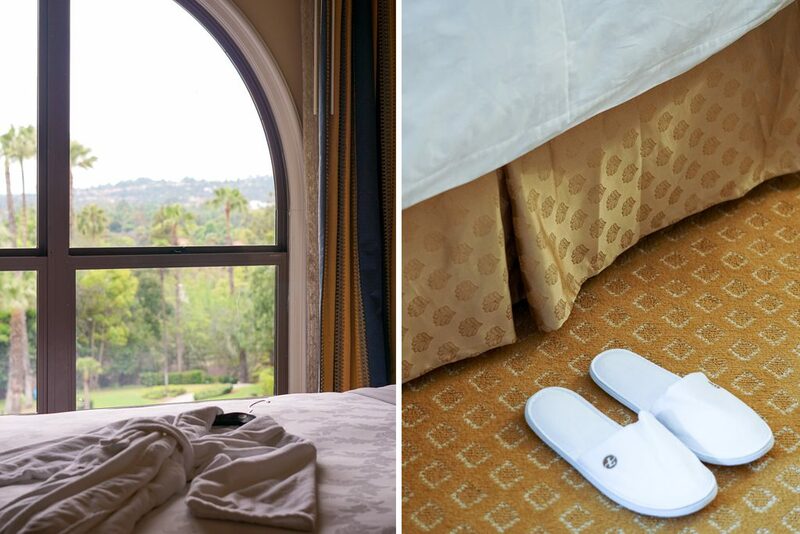 Thank you to The Langham Huntington for providing the perfect escape from the city! I love the outfits.Especially the second floral one. This hotel for sure is a gem! The perfect place to calm down, relax and enjoy. You look darling in all those outfits Christine! This hotel looks amazing, I can certainly see myself enjoying my stay there! 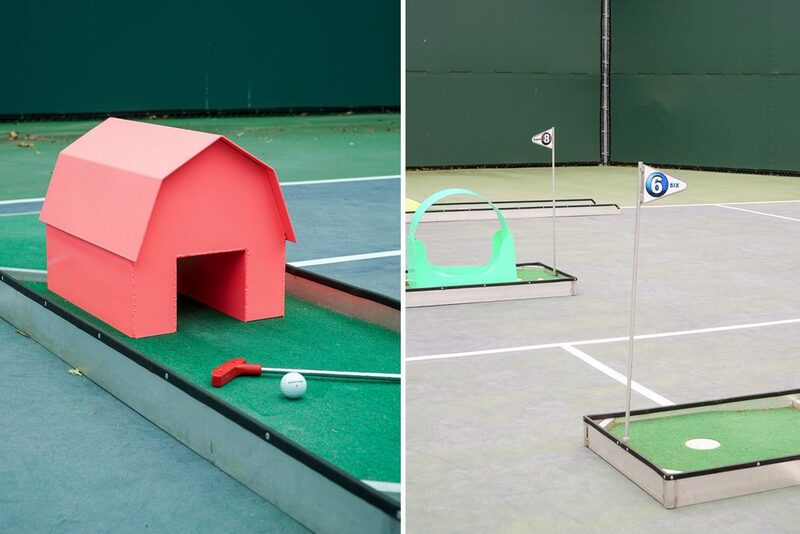 It has all the facilities one can dream of! 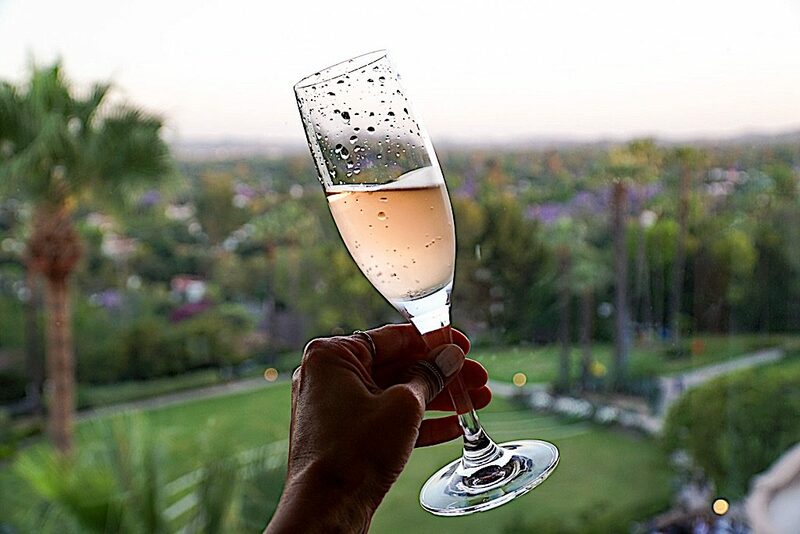 Wow thank you for sharing your stay at The Langham Huntington! I love how detailed you were about the rooms and decor. Your photos are also absolutely gorgeous and I am in love with all your dresses. As you know, I also had a staycation so I love that you were able to enjoy yourself without actually leaving California! Wow this hotel looks absolutely stunning, I love the decor and the rooms. The food all looks so delicious, and the pool looks awesome. I love all of your dresses you were wearing in this post, and the pink high wasted bathing suit, I could totally see myself wearing this, thanks for sharing! 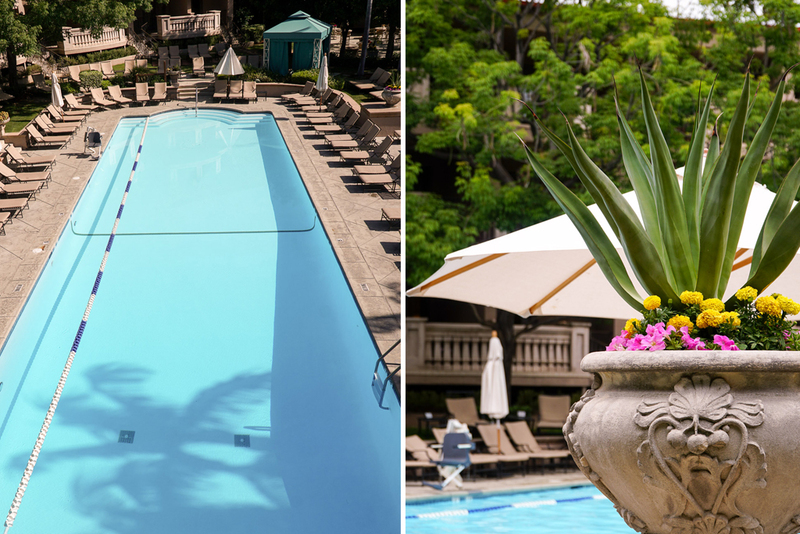 The Langham Huntington is definitely a hidden Oasis! 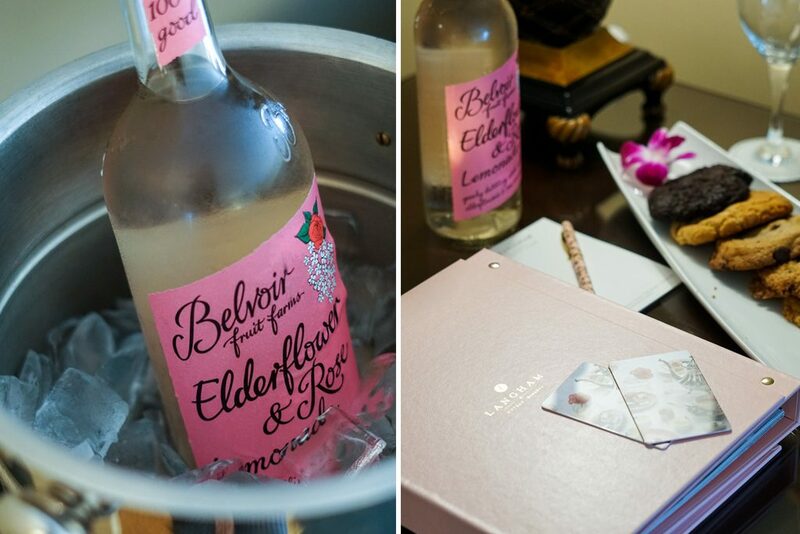 Love all the stunning pictures you took and really make me want to visit this gorgeous hotel. The hotel looks so luxurious and old world charm. The afternoon tea looks so scrumptious and love all your stylish outfits. Among them all, the pick swimming two pieces are absolutely so stunning on you. You are such a hot mama. I am going to stay in Sal Cal for a month and will definitely visit this stunning hotel. Thanks for sharing Christine! I love the Langham in Pasadena. Such a beautiful hotel! Ohh, it’s been a few years since I’ve been there! The last time I was here was for dinner at the restaurant downstairs, but I remember it being so pretty even late at night! <3 🙂 Loving all of these great photos, Christine! Love all your summer looks, but my favourite is the pink bikini. 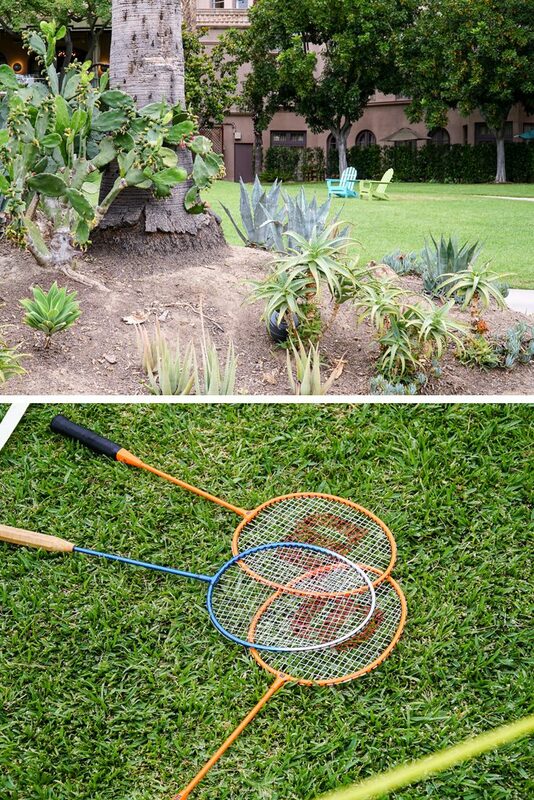 I haven’t seen a hotel with such lovely grounds and with a variety of games to enjoy on site. 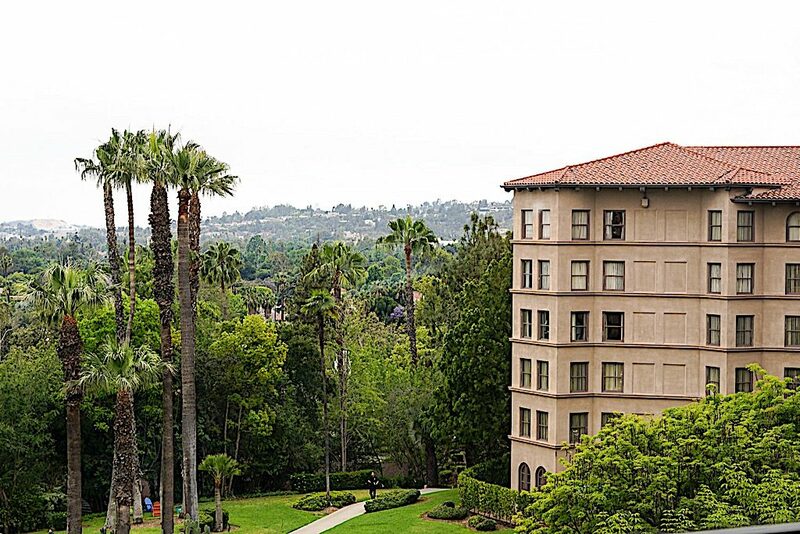 I didn’t even know there was 23 acres to spare in Pasadena! What a lovely hidden oasis. The Langham looks like it’s straight out of England or something. 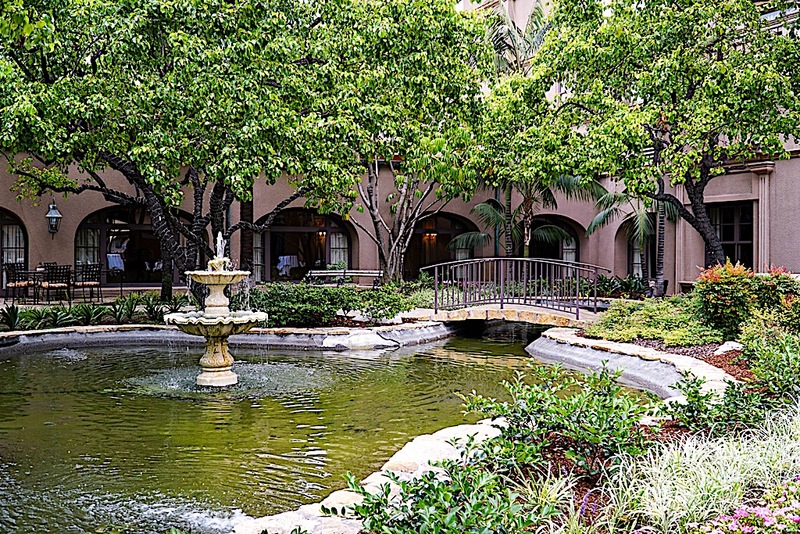 There is so much to see and do outdoors, I mean the courtyard alone is a masterpiece!! I love all your pretty floral dresses and that pink high waisted swim suit! There are so many Instaworthy shots to take which is always a plus in my book! Wow, I’ve never been in that place. Such a gorgeous hotel you visited. I’ll put it on my list for my next trip to California. P.S. Thanks for giving contact details and address . Wow, I’ve never been in that place. Such a gorgeous hotel you visited. I’m dying for that swimming pool! I must check it during my next trip to California. It looks so gorgeous there. The decor looks so nice and charming, and I love the outfits you wore there. W-O-W , did you just see me dropping my jaw in front of my laptop? This hotel is so majestic and luxury!! So are your resort outfits. I adore all those looks. What an amazing getaway trip. I will have to visit Langham Huntington one day, so I can feel like I’m a princess living in a big castle! 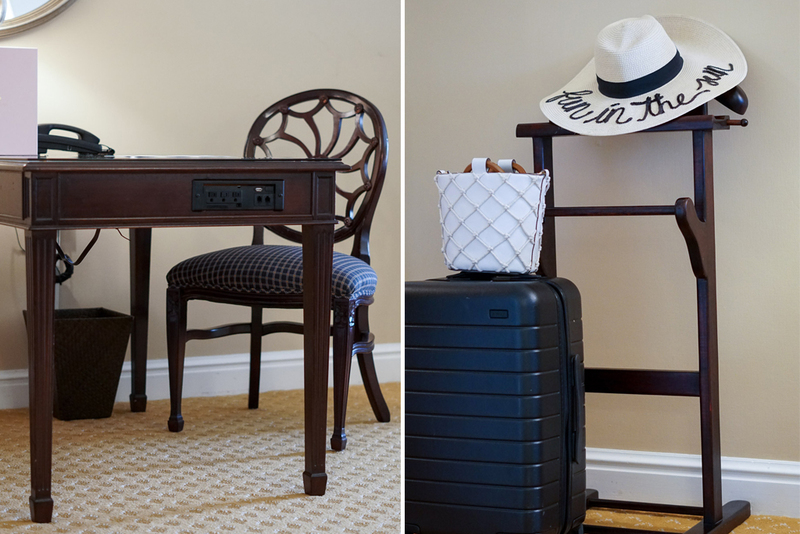 Looks like an amazing place to stay, great post – thank you so much for sharing! Looks like perfect place to spend some quality time!! I so loved the dresses you worn! You doesn’t love to be pampered?! I love everything about this Hotel. I really appreciate when they leave toiletries and free goodies. The shower is just incredible and the photos on the garden are just amazing. Thanks for sharing! Oh dear, you look fabulous on those dresses! Can’t choose between the 1st and 2nd dress. The white laced dress is really pretty too; delicate, feminine, and really elegant! Wow! This place is majestic! This hotel has an amazing architecture, it looks like a museum. Love it so much, especially the gardens. You chose a wonderful outfit, on point for the situation. Thanks for sharing this beautiful pots. I really enjoyed all of your images too. Stunning feed and review about the hotel. Your feeds are so detailed and love how you writing and taking pictures. The dresses are gorgeous love so much the Nordstrom dress, the bucket bag and the red twin set . So cool as the bikini. wow that hotel looks stunning! Babe, are you sure you don’t live there permanently? You look so relaxed and at home when posing around the hotel. Also love how eloquently and almost poetically described arriving to the hotel, giving us a feeling of being with you upon arrival. When settled in I’m, as a history nerd, sure I would take the guided tour of the grounds to begin with, then sit down for their famous afternoon tea (I could live on scones alone!) and end up by the poolside. I’d leave the lane for active swimmers to actual active swimmers though, haha. The suite you had is stunning and so is the view from it. This is what I call a hotel review and should be featured in travel guides. 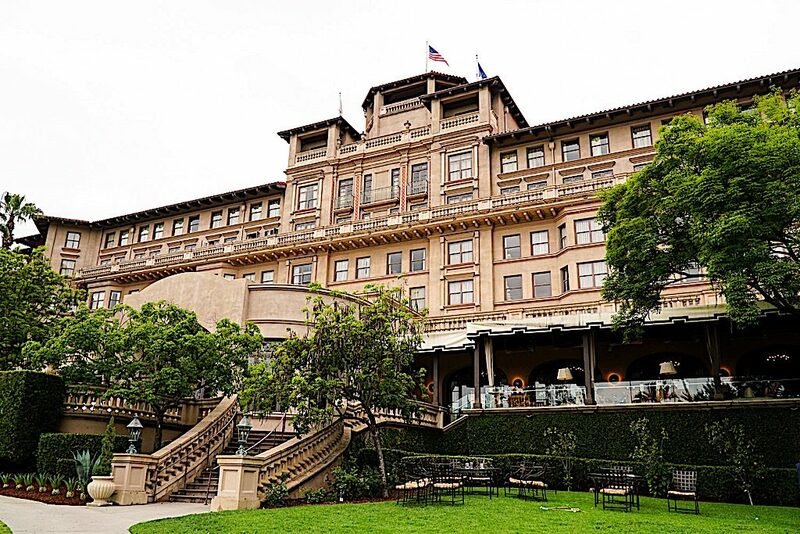 You absolutely sold The Langham Huntington to me! The Langham has been on my list! I need to make a trip up there, it looks so gorgeous, and I love that yellow dress that you’re wearing too beauty! 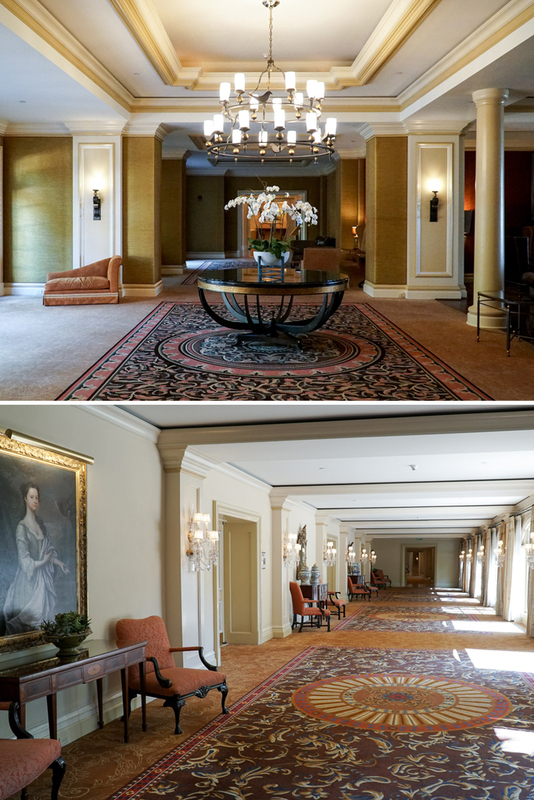 I used to live so close to the Langham in Pasadena and I still have yet to visit! These pictures are gorgeous, I’m glad you had a good time! Ahhh this looks amazing! You make me want to go there and stay there forever! I love your hotel room and your outfits! My goodness! Beautiful! 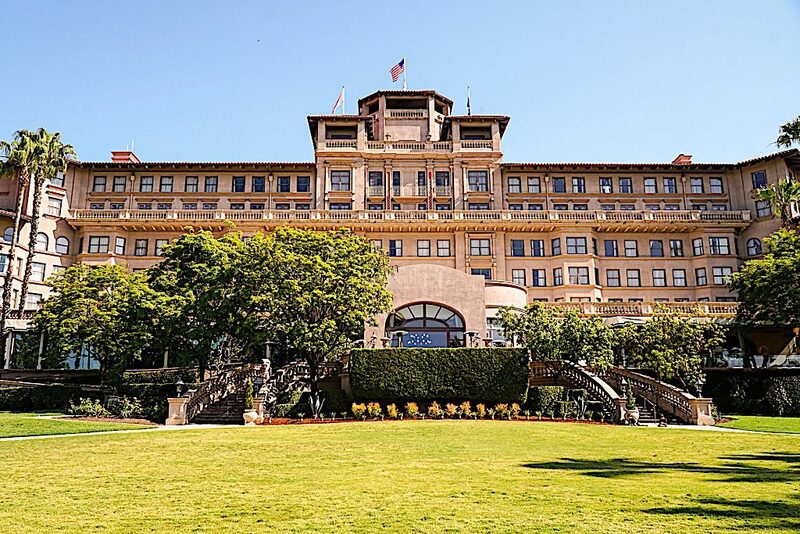 Wow this hotel looks so grand and beautiful, if i’m ever in Southern California I will definitely pay a visit. Loving all of your pictures of this beautiful hotel, and can i have your pink ruffle swimsuit please.